The house has a spacious and luxuriant garden of about 9000 sqm, totally enclosed. Situated in the countryside, the house also has a strategic position since it takes about 25 minutes by car to get to the Adriatic coast and about 50 minutes to get to the Mounts Sibillini where there are ski facilities. The villa is completely redecorated with stones and bricks as the Marche tradition wants it and is located in a hospitable and luxuriant countryside. At a very short distance, one can find a horse riding centre, a swimming-pool and an amazing historic centre. At about 20 Km, there is a golf course for who likes Golf, while at about 50 Km, there is a fantastic professional golf course located on the breath-taking edge of Mount Conero which faces directly on the Adriatic Sea. 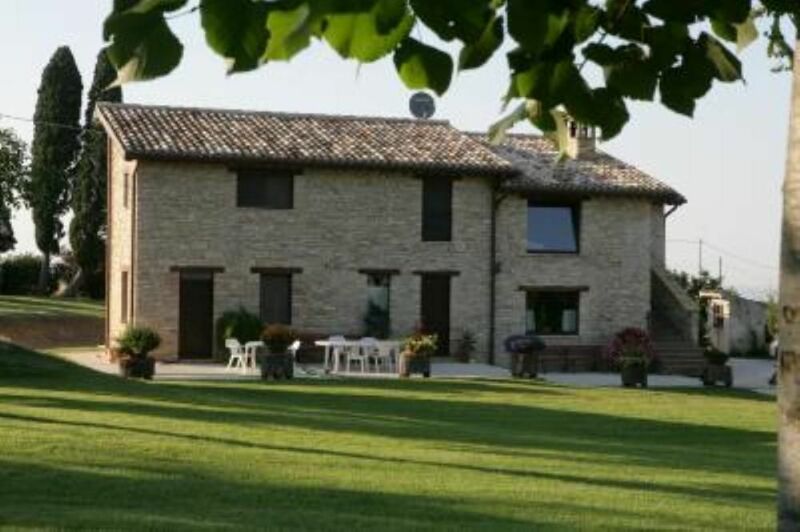 The accommodation is perfectly suitable for whom likes to spend some time immersed in the countryside, to relax or to hike in the amazing landscapes and small villages which are full of history and culture, but also to taste the precious typical wine and food products of the Marche region. We suggest to hike by foot or by bicycle throughout the marvellous landscapes that the nature has given. We do allow pets (prior arrangement). "great hospitality, wonderful accommodation, pleasant hirer and silent enviroment"
Siamo stati ospiti in molte case in Italia e all'estero e questa è senza dubbio una delle migliori. Situata in un contesto calmo e tranquillo ma non distante dai bellissimi borghi delle Marche, la casa è grande, pulita e molto ben attrezzata. I nove posti letti sono effettivi e mai ci era capitato di trovare i calici per il vino e le forchettine per il dessert, per non parlare del biliardino! La zona giorno è ampia e confortevole, arredata con gusto e cura. Il giardino è enorme e molto ben curato, ideale per i bambini e per il relax. Grazie Daniele e famiglia per la squisita ospitalità. Raccomandato a tutti. Siamo stati veramente felici di poter ospitare una cosi bella famiglia. Casa veramente bella e accogliente. Tenuta benissimo. Il proprietario molto cortese e disponibile. La presenza di un solo bagno è stata un po' complicata essendo in tanti, ma, tutto sommato, mi sento di consigliare vivamente la casa. Ospiti deliziosi, auguriamo a tutti di averli come clienti. Magnifique maison avec un immense terrain, située dans un décor enchanteur. Nous avions accès à une cuisine très bien équipée ainsi qu'à 2 jolies terrasses. Nous avons apprécié le calme de la campagne et la beauté de la région de Marches. Il y a beaucoup à voir et à faire et le propriétaire est toujours disponible pour nous faire des recommandations. Ça vaut le détour. une famille merveilleuse qui vient d'un grand pays, nous avons été très heureux de les avoir comme clients et nous espérons avoir encore cette belle famille dans notre maison. The place is lovely, the little town of Treia has many restaurant and bars and it is very picturesque . We had a lovely time, boys enjoying playing in the house garden and with the owners dogs. Very quite and very safe for little children .The house is amazing, very big and with all the amenities. The owners Daniele and Sonia welcomed us with a lovely italian cake and after a day of flying we really appreciated it. From the house is very easy to reach all the sea side places and we enjoyed some fish lunches on the beaches near by. We definitely going back one day!!! Also supermarket is very close.The best place so far for a family of 4 with young kids in the Marche region. From highway A14 – junction Loreto/Porto Recanati. Follow the direction of Macerata, San Severino Marche, after 20/25 Km, turn right in the direction of Treia and you’ll arrive at destination after a couple of minutes. It is possible to arrive by plane at the Falconara Airport (AN), or by train at Civitanova Marche (MC) station. The landlord renders himself available to welcome the guests and take care of the go and returns to and from the airport/train station and the house (price to agree). The use of an own mean of transport or the rent of one once at destination is advisable. We wish you all nice holidays in the hospitable Marche region!!!! http://www.turismo.provinciamc.it/index.asp You will find here a territory of harmonious different landscapes, which beauty has not been damaged by Man. Sea, hills and mountains in sinuous continuity, from beaches to elegantly cultivated fields, spacious pastures, lakes that will enchant you and luxuriant woods which have a quite interesting fauna. The cultural activities of our province range from archaeological areas to museums rich of art and ancient and modern history, from a large variety of shows that touches every kind and genre of music, theatre and folklore dance, from isolated abbeys to small villages and medieval castles, from fascinating commemorations in places that bear the sign of the characters who have marked our identity….A very large range of choices in which every single visitor will be satisfied. Also, come to discover the cradle of musical, theatrical and operatic Art, the Sferisterio of Macerata.